[Rumor]Future Destiny DLC Information Leaked? Bungie's Destiny has been live for about 4 months now, and has already released one DLC, The Dark Below and announced the second, House of Wolves. No more content is confirmed from Bungie yet, but they have let slip plans to have the franchise live on for 10 years, and also that Destiny 2 is in the works. According to a rumor emerging from Twitter, a rather blurry image shows future plans for DLC's to the current game. According to those who have deciphered the image, not only will we have House of Wolves to look forward to in March, but 3 more additions to the game. Comet: Plague of Darknes, Vex [unreadable] and Forge of Gods are the names barely readable from the image. Only Comet comes with a planned release date, and it is currently set to September. 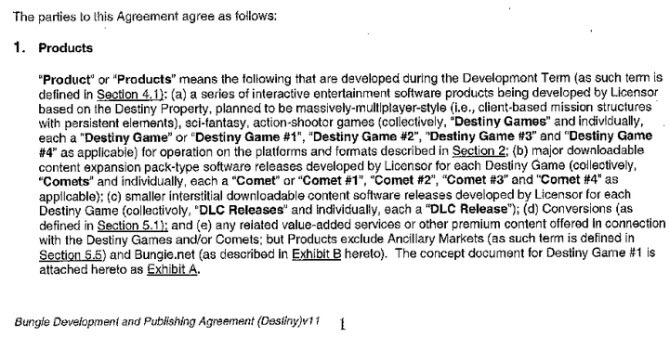 It is also worth to note that Comet seems to be a disk release, which implies more content than the other DLC's, or that it will be released with the game itself and previous DLC included. The release dates shown seems reasonable enough, and with the details on provided by Reddit we get some extra information of what we can expect content wise. House of Wolves will play out in the Cosmodrome, on the Moon, on Venus, and the Reef and include 3 story missions, 1 strike, 1 raid and 4 new PvP maps. The larger Comet: Plague of Darkness is due out in September and has content located on the Moon, Venus, Mars and a Hive Ship. It features a whopping 12 new story missions, 4 strikes, 1 raid, 1 new location (most likely the Hive Ship) and 6 new PvP maps. And not only this, there will be new subclasses and 2 new weapon types as well. If this is true, it would mean big news for the Destiny community, as both subclasses and weapon types really can be game changers. This DLC is, according to the source of the rumor "NOT 'DESTINY 2, this is just a massive DLC that will be marketed on a disk from which to make a download of destiny, is like a DLC but normal much larger and heavier." The Vex and Forge of Gods have no scheduled release yet and there is a little less information provided for these. It looks like The Vex DLC will be located on Mars and Venus and have 3 story missions, 2 strikes, a raid and an unknown amount of PvP maps. Forge of Gods have no information but the name yet. This information seems to originate from the Bungie forums in Italy, and the image is supposed to be taken in an internal Bungie meeting held in October. As with all rumors, we will have to take the information presented to us with a grain of salt until Bungie eventually comes out to confirm or disprove. If this holds up, what do you think about the content to come? Is this what you expected from Bungie and Destiny?